A comprehensive standardized self-report questionnaire. 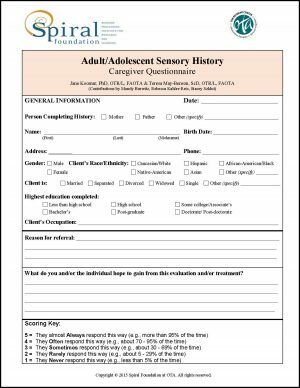 An alternative caregiver questionnaire for parents or other caregivers of adolescents or individuals with disabilities. 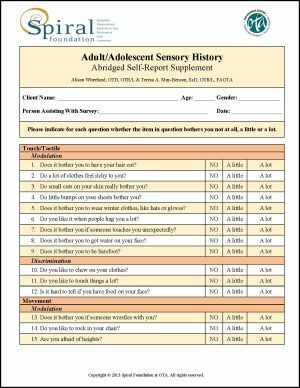 An abridged and simplified self-report supplement to the caregiver questionnaire for younger adolescents or individuals with disabilities who may not be able to complete the comprehensive self-report questionnaire. 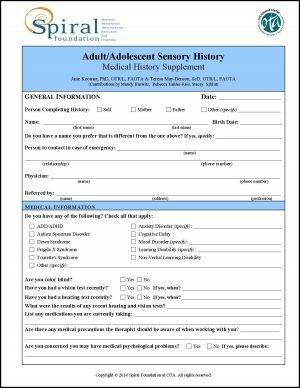 A supplemental medical and developmental history form. A comprehensive, standardized research-based scoring program for use with the self-report questionnaire or caregiver questionnaire. Numerous standardized subscores to assist with identifying discrete patterns of dysfunction in processing and integrating sensory information, which allows for clinical utility in treatment planning. A comprehensive manual detailing the use, administration and interpretation of the Adult/Adolescent Sensory History. It includes instructions for use of the Adult/Adolescent Sensory History Scoring Program© as well as case studies to aid in interpretation. The research base for the measure is provided in detail withing the manual. The primary questionnaire for the measure. It is designed to be completed by the adult or adolescent themselves either independently or with assistance. Standard scores may be obtained for this part of the measure. Designed as an alternative for the Self-Report Questionnaire. It is designed to be completed by a parent, guardian or other caregiver of an adolescent or adult who is not able to complete the Self-Report Questionnaire themselves. This form is nearly identical to the Self-Report Questionnaire but is worded for the caregiver responses. Standard scores may be obtained for this part of the measure. Designed to complement the Caregiver Questionnaire. 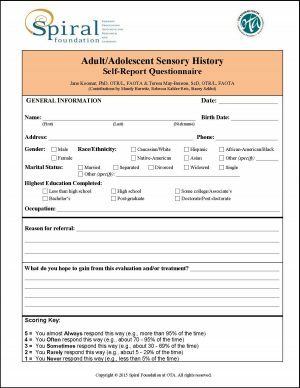 The Self-Report Supplement consists of 63 items from the comprehensive Adult/Adolescent Sensory History – Self Report Questionnaire. The specific items were chosen based on statistical analyses from several stages of research on the Adult/Adolescent Sensory History and are worded at the 4th grade reading level with simplified responses. At this time standard scores may not be obtained for this part of the measure. 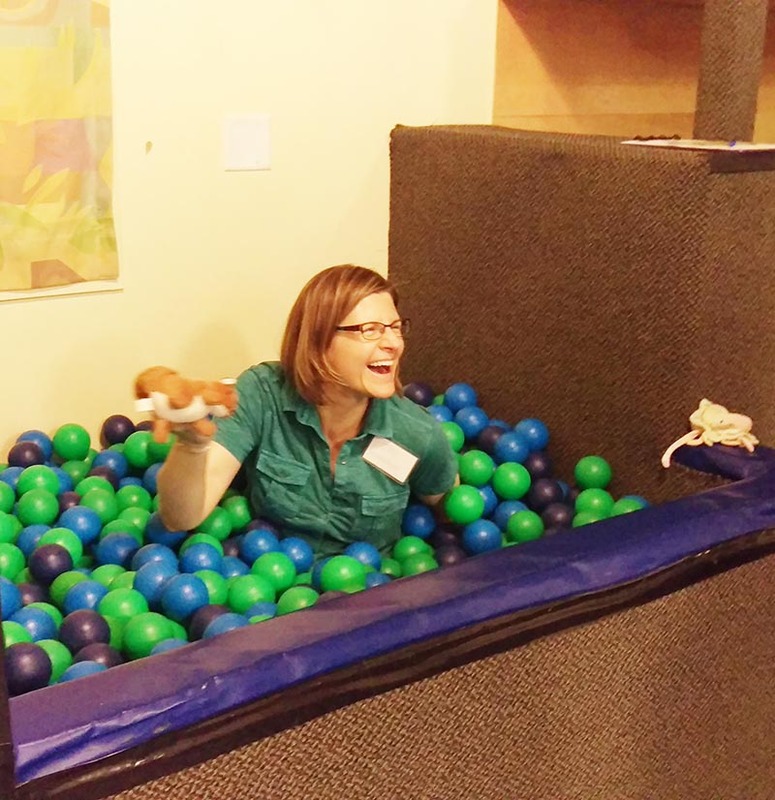 Designed to obtain important background, medical and developmental information needed for a comprehensive sensory integration-based assessment. It includes information that may be of interest to a variety of professions such as birth and developmental history, medical information and the individual’s areas of concern. Information obtained may be used to assist with treatment planning and clinical reasoning but is not entered into standardized testing. Designed to score the Self-Report Questionnaire and Caregiver Questionnaire. The test administrator enters demographic information as well as the question responses into the program. A one-page report form suitable to give to clients and for storage in client records is generated automatically. The report provides standard scores for all test subscores as well as score interpretations. **Important Note for International Customers: Cost does NOT include fees that may be incurred in your country, including VAT. Customer may be responsible for paying these on delivery. Includes User’s Manual, Scoring Program, 5 Self-Report Questionnaires, 5 Caregiver Questionnaires, 5 Self-Report Supplements, 10 Medical History Supplements.